September 25th, 2015 – A new survey of Canadian experiences with the health care system finds significant divides when it comes to access to primary care. Divides that, in turn, are tied to opinion of the system, and of health care as a voting issue in this federal election campaign. The latest public opinion poll from the Angus Reid Institute examined, among other things, whether Canadians have their own family doctor, and among those that do – how easy or difficult it is to see the GP when needed. Across the country, about ten per cent say they are looking for a family doctor but can’t find one, five per cent don’t have one but don’t care, while one quarter (25%) say they have a GP but find it difficult to get an appointment. Taken together and discounting those who don’t have and don’t want a GP, slightly more than a third of Canadians have difficulty accessing a family doctor. In Quebec, this group makes up more than half of the population. Access to primary care is closely associated with attitudes towards the quality and direction of the health care system as a whole. Those respondents who describe their primary care access as “easy” or “acceptable” are almost twice as likely to give positive ratings to the system as a whole. Those who say they have difficulty making an appointment or who are looking but can’t find a GP are more likely to express negative views about the quality of health care in Canada. Experience with primary care is also closely associated with views on the performance of government, the importance of health care as a voting issue and perceptions of the parties and their leaders on the issue. The one third of Canadians with limited access to traditional primary care are most likely to give poor ratings of both the federal government and their province. They are also more likely to see Thomas Mulcair or Justin Trudeau as strong on the health file. Those with easy access to primary care are most likely to vote for the CPC while those with difficult access tend to be NDP supporters. Assessing access to primary health care has to go beyond the simple question of whether or not one has a family GP, and include some measure of the accessibility of that GP. Consistent with other studies, this new ARI survey finds 16 per cent of Canadians do not have a family doctor. But, actual experienced access to one’s GP — how easy or difficult is to get in to see them — is an additional important part of the primary care equation. Among those Canadians without a GP, the largest proportion — 10 per cent of the total population – have been looking but haven’t yet found one; they currently have “No Access” to primary health care from a family doctor. They are joined by a “Difficult Access” segment, comprising an additional 25 per cent of Canadians who have a GP but find it difficult to get in to see them. As we’ll see below, these two health care “outsider” segments share much common ground in their experiences and attitudes towards the system. 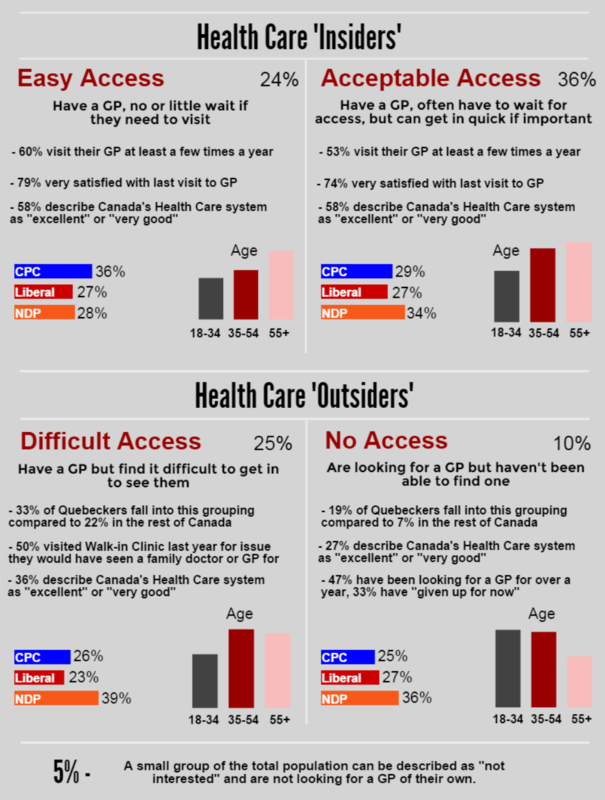 As do the six-in-ten (60%) Canadians who are health care “insiders”, including: one-in-four (24%) who have a GP and enjoy “Easy Access” to them, and another one-in-three (36%) who have “Acceptable Access” to their GP. These segments are summarized in the following infographic. Who has the best and worst access? An important part of the primary care story concerns Quebec versus the Rest of Canada (ROC). This Angus Reid Institute survey shows only four-in-ten (41%) Quebeckers belong to either “insider” group while a full majority of 52 per cent of Quebecers have either Difficult or No Access to primary care (33% and 19% respectively). Across the ROC, meanwhile, one-in-three rated as “outsiders” (22% Difficult Access and 7% No Access). Within ROC, the survey findings show somewhat better primary care access in the larger provinces and also in the largest cities (though “rural” respondents rated roughly average). Importantly, primary care access does not appear to be massively driven by socio-economic factors. These ARI findings show consistency in the access profiles of lower versus higher income Canadians and across formal educational strata. Generationally, older Canadians are more likely to enjoy Easy Access — indeed, almost half this segment is over 55 (and, relatedly, they also access more health care services). The No Access segment tends a bit more towards younger people, including younger families (a cohort also getting squeezed on other fronts – notably homeownership in the nation’s largest cities). Gender-wise there is broad equality in terms of insider versus outsider status, but within the latter we see more women in the Difficult Access group while there are more men who have No Access to primary care. Access to primary care has important implications for the health care system. The collateral wear and tear on other health care access points is the subject of much academic research. In 2014, Statistics Canada found that 81 per cent of the roughly 4.5 million Canadians without a regular doctor had a place that they usually go when sick or in need of health advice – in most cases, a walk-in clinic. This ARI survey looked at usage of hospital ER’s and walk-in clinics in lieu of access to a family doctor. In total, 25 per cent of Canadians surveyed said they had gone to a hospital ER this past year for something they could or would have seen a GP for, and 40 per cent said they had used a walk-in clinic in lieu of a family doctor this year. Many made multiple visits to these alternate health care venues. This is highly correlated with access to primary care. The two segments with access to their own GP still go elsewhere in quite significant numbers: roughly one-in-five visited a hospital ER this year for something they “would have seen their GP for but could not get an appointment with them quickly enough” (19% of the Easy Access segment and 23% of those with Acceptable Access did so this past year). This increases to fully one-in-three Canadians with Difficult or No primary care access: 34 per cent and 31 per cent respectively visited a hospital ER in lieu of a family doctor at least once in the past year. Walk-in clinics see even more traffic as a result of GP availability (or lack thereof) — rising to a full majority of those with Difficult (50%) or No Access (63%) making at least one walk-in visit in the past year for something that could have been seen by a family doctor (had one been available). There has also been a great deal of research on differential patient outcomes based on the quality and accessibility of primary health care services. This ARI survey simply asked surveyed Canadians if a medical professional had made any errors in their care in the past year. One-in-ten of all respondents reported this had happened to them — ranging from seven per cent of the Easy Access segment up to 16 per cent of those with Difficult Access. Those who have Difficulty Accessing their GP are also significantly less likely to say they were “extremely” or “very satisfied” with their last visit to that professional (absence not making the heart fonder in this case): 55 per cent of the Difficult Access segment were this satisfied with their last GP visit compared to three-quarters of their counterparts with Easy (79%) or Acceptable Access (74%) to their GP. The same overall pattern is observed for other aspects of GP interaction. Across five specific dimensions assessed, those with Easy Access gave much higher overall satisfaction ratings than those with Acceptable or difficult Access — with an average satisfaction gap of 15 points , rising to over 20 points in the case of “the amount of time the GP spent with me”. In the case of medical specialists, three-quarters of those in the Easy (76%) and Acceptable (73%) segments who had seen a specialist this past year gave an excellent or very satisfied assessment; this specialist visit satisfaction level declines to 58 per cent of the Difficult Access segment and only 49 per cent of those with No Access. For hospital emergency rooms/ER’s, the survey records lower satisfaction levels overall with a more modest 38 per cent of all past year ER visitors saying they were extremely or very satisfied with their most recent visit, while one-in-three (30%) voiced some degree of dissatisfaction. Again, one’s access to primary care plays a role in Canadians’ ER visit assessments with high satisfaction voiced by 62 per cent of Easy Access ER visitors, down to 40 per cent of those with Acceptable Access, down again to only 27 per cent of those with Difficult Access and 25 per cent of those with No Access to traditional primary care. And for walk-in clinics, we also see more modest satisfaction levels with 44 per cent of all past year visitors voicing high satisfaction with their last visit. Again, this patient satisfaction level declines from 51 per cent of walk-in visitors who have Easy Access to their own GP, down all the way to 30 per cent among those with No Access to a GP of their own. Access to primary care not only drives individual Canadians’ perceptions of their own experiences with the health care system, it also affects how they view the system’s overall quality. This survey also asked Canadians whether they think the country’s health care system has improved, stayed the same, or deteriorated over the past 10 to 15 years. Across the whole sample, only 16 per cent believe the health care system has improved during this time compared to 42 per cent who believe it has deteriorated (the remaining 42% said it has stayed the same). To facilitate easy comparisons across groups, a “momentum score” can be calculated by subtracting the percentage who say the system has deteriorated from the percentage who say it has improved; higher scores therefor denote a more positive assessment, and lower negative scores a more negative outlook. The rather downcast assessment among the total sample yields a score of -26 (16% improved minus 42% worse). Those in the Acceptable Access segment are roughly on par with the overall population. The two cohorts with limited access to the system — the Difficult Access and No Access groups — give the system considerably more negative scores. Personal experiences with access to primary care also shape Canadians’ views on the government’s administration of the health care system. While health care is a provincial responsibility, the federal government provides the bulk of the funding for each province’s system. For this reason, ARI asked respondents how satisfied they were with each level of government’s handling of health care. It should be noted that more than 60 per cent of each group chooses a number in the scale’s middle range — between four and seven — as do roughly two-thirds of Canadians (64%) overall (see detailed tables at the end of this release). Who’s best on health care? So far, the NDP has mentioned health care issues considerably more than the other parties during this campaign, promising $2.6 billion for investment in a national pharmacare plan (read our recent report on pharmacare here), $1.8 billion for improved seniors care, and other, smaller pledges. Whether owing to his focus on health care or not, NDP Leader Thomas Mulcair is seen more favourably by Canadians on various aspects of the issue than the other main party leaders – especially Conservative Leader Stephen Harper. Respondents were asked whether they agree or disagree with three statements about how each potential prime minister would handle health care if his party formed the next government. 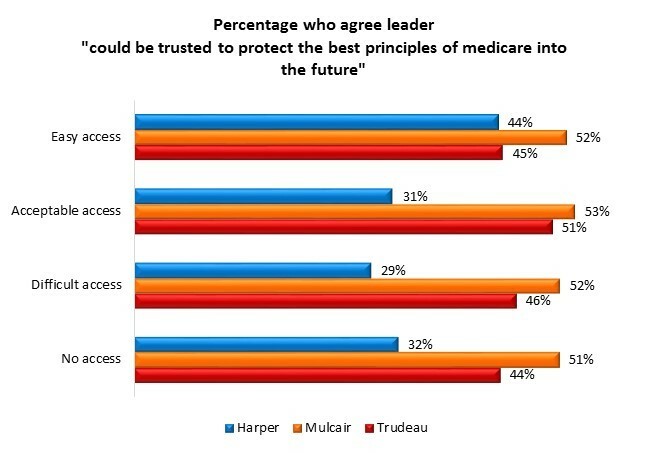 Roughly half of Canadians agree that Mulcair “could be trusted to protect the best principles of medicare” (52%), “would work with the provinces” to improve its delivery (52%), and “would provide sound federal oversight” of the system (49%) – more than the number who see either of the other leaders this way. Looking at these questions according to the four main segments of primary care access, this poll finds Mulcair is seen as best on those metrics across every group. Likewise, the Easy Access segment is more likely than other groups to see Harper working with the provinces toward improving health care delivery – though on this question he is well behind both Mulcair and Trudeau with every group. Mulcair and the NDP have the greatest support among the other three main groups, while the Liberals place third with every segment except for those with No Access, where they have more support than the Conservatives, but remain nine points behind the NDP.